Raleigh, N.C. – The state House of Representatives honored the visiting North Carolina A&T State University Aggies football team Thursday for their undefeated championship season and second Celebration Bowl victory in three years. 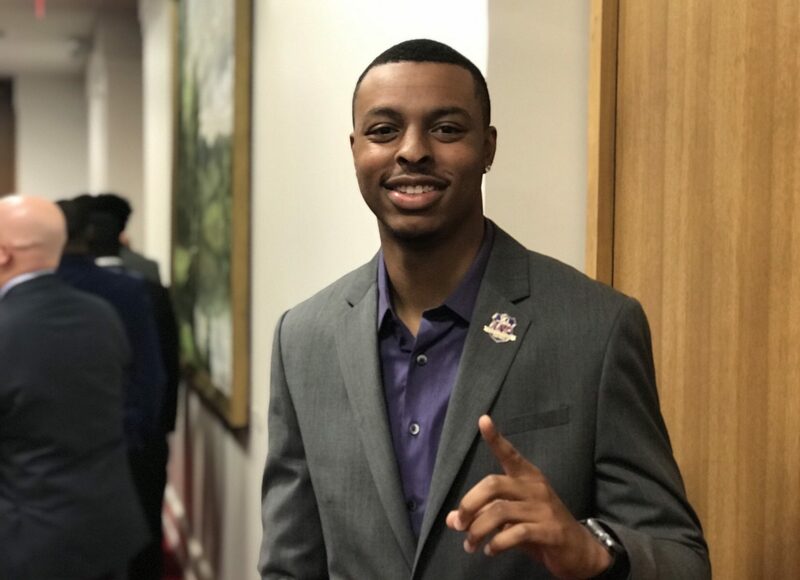 Led by star Quarterback Lamar Raynard (pictured), Offensive Player of the Year in the Mid-Eastern Atlantic Conference (MEAC), the Aggies also won their fourth Historically Black College National Championship in 2017. “It is a privilege to acknowledge the commitment to excellence and dedication to purpose embodied by these North Carolina A&T Aggies,” said state Speaker of the House Tim Moore (R-Cleveland). The Aggies are the first team in MEAC history to finish a season undefeated. “This team was led to an undefeated season by he who I call ‘The Master-Mind of Market Street,’ Coach Rod Broadway,” said state House Rep. Amos Quick (D-Guilford) from the floor of the House. Coach Broadway retired at the end of the season and leaves an enormous legacy at the institution. Reives represents the university area in the state General Assembly. Nearly 12,000 students attend N.C. A&T State University in Greensboro, making it the largest HBCU in the country.